Banglalink Balance Transfer System! 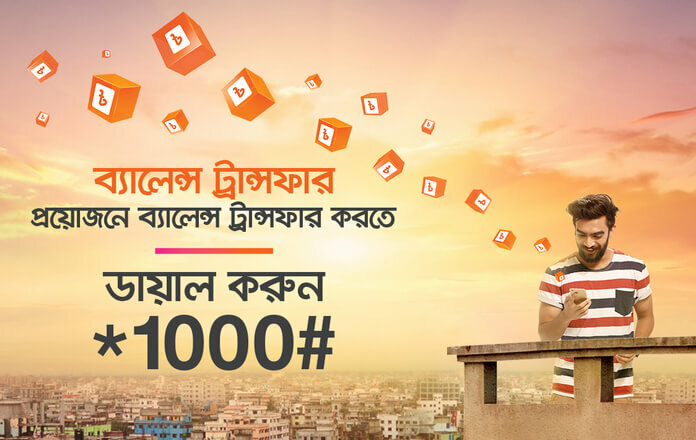 Banglalink user can enjoy balance transfer system minimum Tk 10 to maximum Tk 100 can be sent in a single transaction. A customer 500 Tk in a day and 1000 Tk in a month can be transferred, the balance transfer system will work only BL to BL numbers. Life is going to be abundant easier currently, as a result of Banglalink is introducing balance transfer service simply transfer credit to your friends and family who use Banglalink range, anytime you would like. Please follow the instructions given below to transfer Banglalink balance. To register, you have to dial *1000# USSD. The Customer will receive a pin number in reply to the registration SMS. Balance transfer service available in prepaid USSD menu. Dial *1000# >Balance Transfer >Amount >Enter the partner number > Enter your PIN. Go to the new message option and type ‘BTR<space>Amount<space>Patner Mobile Number<space>PIN’ and send it to 1000. To change pin number dial *1000# >Change PIN >Enter Current PIN >Enter NEW PIN >Confirm PIN. Minimum 10 Tk and maximum 100 Tk will be transferred in a single transaction. Maximum 500 Tk in a day and 1,000 Tk in a month can be transferred. Tk. 2.44 (including VAT, SD & SC) from the sender’s balance.